Havre isn’t exactly the kind of azure city at the French Riviera, but despite its industrial character it’s got a few attractions to offer. 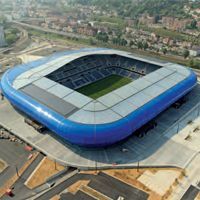 One of them came last year as the city received its €100-million new stadium. Not cheap, but still great value for money. Obviously the form isn’t anything astonishing especially in times, when similar rounded arenas with strong colourful illumination are built around the world. But this one is really well thought through in terms of both aesthetics and symbolism. It’s blue all around, emanating by day and night – lighted by sun from outside and by dozens of lamps from the inside. Inner promenade gets bluish light from sunshine coming through the foil wrap. Seats and even the roof are also blue. All in all a very solid set of maritime associations with waved main stand and its cover breaking the humdrum line of other stands. It’s simple, but works just fine for us. Seating layout makes a great impression with dominating upper tier, while placing almost all premium seats (quite a few as well!) on the main stand allowed to avoid splitting regular fans with business tiers, a frequent atmosphere spoiler in recent designs. These are our thoughts. We’re eager to see how you perceive this stadium. So let us know by voting for Stadium of the Year before February 23!